13/16" Sterling Silver St. Michael Medal Made in the USA. The Medal is adorned with a Depiction of St. Michael Slaying Lucifer. Would you like it engraved? We can engrave the back of the medal with a special message for an extra fee. See the product details box on this page to specify engraving. Supplied with an 18" Genuine Rhodium Plated Chain in a Deluxe Gift Box. This Sterling Silver St. Michael Medal is made in the USA. 1 x 7/8-inch Sterling Silver St. Michael the Archangel Medal. Comes as a ready-to-wear package with a silver chain and a premium keepsake jewelry box. This Religious Coin Token - Padre Pio- Pray, Hope, and Don't Worry can only be purchased in these bulk lots of 25 units at a discounted wholesale price, which is now available to the public. These discounted bulk packs offer the perfect solution if you want to give these Catholic goods away as gifts or to use as free envangelizing tools. Imported from Italy. Our St Chris/Ga Son Visor Clip features our money-back guarantee. 15/16" Sterling Silver St. Michael Medal Made in the USA. The Circular Shaped Medal with Engraved Edging is adorned with a Depiction of St. Michael Slaying Lucifer. The Reverse side of the Medal Portrays a Prayer to St. Michael. 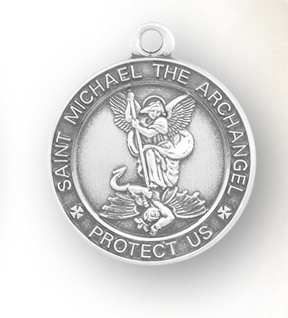 This Sterling Silver Circular Shaped St. Michael Medal is made in the USA. 7/8" Sterling Silver St. Michael Medal Made in the USA. The Shield Shaped Medal with Rivet Edging is adorned with a Depiction of St. Michael Slaying Lucifer. Would you like it engraved? We can engrave the back of the medal with a special message for an extra fee. See the product details box on this page to specify engraving. A 18" Rhodium Plated Curb Chain is Included with a Deluxe Velour Gift Box. This Sterling Silver Shield Shaped St. Michael Medal is made in the USA. 7/8" Round Sterling Silver Saint Michael Medal on a 24'' Gift Chain. This Medal Comes in a Deluxe Velour Gift Box. This Round Sterling Silver Saint Michael Medal on a 24'' Gift Chain. This Medal Comes in a Deluxe Velour Gift Box. is made in the USA. 1-1/16" Sterling Silver St. Christopher Lacrosse Medal made in the USA. The Oval Medal is adorned with St. Christopher carrying the Infant Jesus. The reverse side of the Medal Portrays a Male Lacrosse Player. What's included? A 24" Rhodium Plated Curb Chain is Included with a Deluxe Velour Gift Box. This Sterling Silver St. Christopher Lacrosse Athlete Medal is made in the USA. 15/16" Sterling Silver Navy St. Michael on Reverse Side. What's included? A 24" Rhodium Plated Chain is Included with a Deluxe Velour Gift Box. This Sterling Silver Navy Medal with St. Michael on Reverse Side is made in the USA. 7/8" Sterling Silver Portrayal of St. Gabriel's Angel Wings holding a Staff of Lillys. He is the Patron Saint of Messengers, Diplomats, Postal Employees. Would you like it engraved? We can engrave the back of the medal with a special message for an extra fee. See the product details box on this page to specify engraving. A 20" Rhodium Plated Curb Chain is Included with a Deluxe Velour Gift Box. This Sterling Silver Round Shaped St. Gabriel Medal is made in the USA. This Sterling Silver Oval St. Michael Medal has passed our quality control assessment and meets our strict criteria to be a Catholic Shop product. Buy with confidence.